Runners Abraham Kemboi, Mike Koech, Paul Katam and Paul Chelimo (left to right) had a tremendous year for the Spartans. 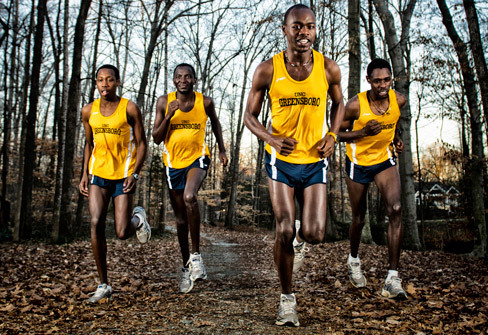 UNCG athletes ran to first place in a number of competitions this year. Both the men's and women's cross country teams won Southern Conference (SoCon) championships, and their coach, Linh Nguyen, did not go unnoticed either. Nguyen was named SoCon Coach of the Year. In the indoor track season, the story was much the same. The men's and women's distance medley team won SoCon titles, with standouts Paul Chelimo and Ashley Schnell winning individual titles and sporting 4.0 GPAs. Men's basketball celebrated an exciting season as they won the North Division SoCon title. The season was topped off with the official naming of Wes Miller as head coach. The season highlighted thrilling wins over The Citadel, College of Charleston, Appalachian State, Samford and Chattanooga. Trevis Simpson and Derrell Armstrong were named to all-conference teams. And Miller earned Anton Foy Coach of the Year in the SoCon. He is UNCG's first men's basketball conference coach of the year in the Spartans' 21-year Division I history. Two-time All-American and former WNBA player and Virginia assistant coach Wendy Palmer was named head coach of UNCG's women's basketball. Jeff Trivette was named SoCon coach of the year for women's tennis and led UNCG to its first league title since 1999 and first-ever outright SoCon title. The Spartans went 10-0 in the league for the first time in school history. UNCG redshirt junior Niltooli Wilkins was SoCon Women's Tennis Player of the Year. A No. 1 seed, she went 10-0 in conference play. On the men's side, UNCG senior Orcun Seyrek was named SoCon Men's Tennis Player of the Year for the second time in his career. He was 10-0 in conference play, as the No. 1 seed. Men's soccer won the SoCon regular season title. In women's golf, Emily Marron was awarded Coach of the Year and Fanny Cnops, Freshman of the Year and Player of the Year. Cnops was also selected to participate in the 2012 NCAA Division I Women's Golf Regionals. In addition to an all-sport cumulative GPA of 3.11, 12 students have 4.0 GPAs and 12 were inducted into the Golden Chain Society  a school record. First ever SoCon post-graduate scholarships were awarded to Ashley Schnell and Peyton Ford. Ford also received Phi Beta Kappa distinction this spring. Spartan athletes performed nearly 2000 community service hours and raised nearly $5,000 for Fox8 Gifts for Kids. UNCG won a national school spirit competition to earn tailgate festivities sponsored by Zipcar, a car-sharing provider that is part of UNCG's sustainability efforts. Votes came in through Facebook and UNCG pulled in five times as many votes as any other university.